Cool stuff! I heard the track a while ago and it was just as ace in the demo. Nice to see a lot of the effects we had in our demos but just done with a bit more resolution and color. Props for using all that ROM space for good purposes! Doesn't feel much like a typical VCS demo in a good way. Good choice of colors too. Tasty color scheme, tasty Coke and candy world's first VCS fullscreen upscroller. Yummy! ... I said to myself that it was going to be the last 2600 demo for me. But the lure of fighting against 128-byte-RAM limits managed to draw me back in! rulez added on the 2012-12-09 17:57:46 by JAC! Youtube not as good as real thing (or emu for that matter). Especially the rotating bottles for some reason looks very washed out in the video. Nice VCS demo with great music. neat effects, fast and non-glitchy, but otherwise i find this to be a pretty standard fx show lacking any and all depth, not even close to trilobit/wamma demos. thumbs up for the code tho. Nice transitions, cool effects (plotcoke! ), great music. In the first effect the top of the screen doesn't seem to be blanked properly. This is visible in MESS and on my TV but not in Stella. The scanline count is off in a few places when switching scenes. Not noticable on the TV luckily. Cool! More highres effects than other Atari VCS demos. Looks less than your typical VCS demo in a good way. i even enjoyed the tune, so extra thumb. 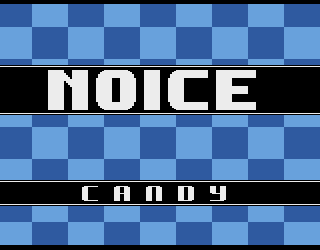 Om nom nom nom those candies. Well designed demo and cool tune, i'm really impressed how you make some cool effects on a such old machine. Impressively crisp graphics, nice effects, and the music is nice as well. 1977 is back! Very nice! As others have said, untypical for VCS, which is great. i don't think the music quite hits the spot, but nice effects! Oh yeah. Really nice one! also superb soundtrack, thanks Ilmarque! rulez added on the 2012-12-10 12:47:37 by ɧ4ɾɗվ. How, why, in the name of what?? Great style! What a pity I couldn't record the audience... big applause from the beginning! Fantastic A2600 stuff! VCS demo taken to the next gen level ! Impressive demo for the VCS. Music is good, that's a real performance on this machine ! Wow. Atari 2600 demos have evolved in an extremely impressive way and this is - at the moment - the icing on top of the cake. Hard to believe all this is 2600. I can't believe what I see, deep respects. I don't really know the capabilities of the VCS deeply, but this seems astonishing to me! I m p r e s s i v e .
128-byte of RAM. I had a vcs when I was little. These fx make the old time stuff look pretty pale. I had a VCS as well, and this is a jawdropper for me. Once again, ups for (retro) console demos. Wait what ? This, Atari 2600, not an Atari 8bits computer ? Impossibru ? Where is my jaw ? But here's my thumb. Best demo for vcs so far for me! Great work! Nice FX, good colors and music, VCS! This is really one of the top VCS demos - great effects, but especially great style and design. No screaming coder colors or ugly raster bars (my pet peeve with most other VCS demos) and it even has transitions! And the music is great, too. Very polished demo for the 2600, great music track too! I love the clean and polished style of this one. Good music too! Impressive demo! Nice use of the VCS limited hardware! Very nice demo with a very nice tune! page created in 0.020088 seconds with 15 queries.